The two primary causes of species extinction are ....? Can you succinctly state them? 1. Over-predation. Basically, the animals are hunted and killed faster than what they can reproduce. Have you noticed how so many programs, "new" initiatives, and anti-cruelty organisations strive to deal with the issues created by people? And (this is almost funny if the outcomes weren't so destructive) how governors and other "do-well-ers" point to almost every other contributor OTHER THAN people. Politically, of course, that's all dressed up as "balance" and "proportionality". For example, concerns about dwindling native birdlife have been attributed to "wild and feral cats", and overlook the empirical evidence associated with "habitat loss" associated with the urban spread of .... you guessed it - people. So what would a sustainable future look like, if people's professed interests in animals on air, land, and water, were given higher prioritisation? That would be one of the potential outcomes of law properly recognising animals as sentient, according to Dr Ian Robertson of Guardianz Lawyers. 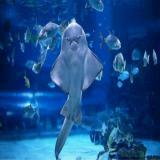 Some of the world's most unusual sharks and rays are on the brink of extinction because of threats such as commercial fishing, scientists have said. And losing even one of these "living fossils" would wipe out millions of years of evolutionary history.